Broken garage door springs can cause serious injury if not handled carefully with the appropriate tools. Rather than risk personal injury, why not trust your garage door spring repair in Fillmore CA to the professionals? At Carroll Garage Doors, we know how to get the job done right, with speed and safety. At Carroll Garage Doors, we know the right way to do garage door spring repair in Fillmore CA. You will not have to worry about our technicians injuring themselves or damaging your property during the repair. Instead, you’ll simply get quality workmanship at a fair price. Waiting until your springs break to call a garage door repair company can be damaging to your door and inconvenient to your daily life. When your worn springs finally do fail, you might not realize it. You might try to continue raising and lowering your door on the broken spring, which could burn out your garage door opener motor. You might even find that your garage door spring problems have made it impossible to open the garage door. Getting trapped in your garage by a broken spring can be extremely frustrating. 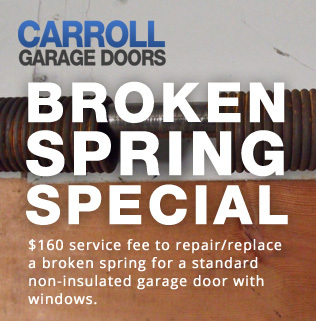 By getting a garage door inspection from Carroll Garage Doors, you can improve your chances of repairing springs before they actually break. By inspecting your springs carefully, we can identify worn springs and replace them before they become a bigger problem. While we’re inspecting your springs, we can also inspect all the other parts that your garage door opener system needs to perform its best and make sure they are in optimum condition. If you need help with garage door spring repair in Fillmore CA or other garage door repair or maintenance services, please do not hesitate to contact Carroll Garage Doors at 1-888-578-2360 to make an appointment.